In his detailed lyrics of innermost uncertainty and near conversational delivery, Mike Kinsella has arguably bridged an intimacy with fans stronger than early Bright Eyes or modern-day Ryan Adams... and that’s no faint praise. Whereas those troubadours often write songs to future or ex-lovers, this Chicago native strips his songs of pretension to the far-end where only he should be blushing. And that’s because, ironically, this project given the name Owen is really The Mike Kinsella Show; a perpetually updated journal that delves so deeply into the man’s vices, guilty pleasures and reckless desires, every narrative is tainted by his twisted perspective, however funny or hungover. 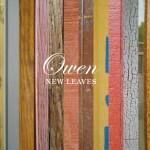 In that respect, it makes sense that listening to a new Owen record is like catching up with an old friend, one who is unapologetically nostalgic and frank, but rarely off the mark. So when this summer’s Seaside EP, a limited release of rare tracks and b-sides, found I Woke Up Today tapering out with a poignant realization (“either I just got kicked in the teeth / or time has changed me”), it registered as a monumental, lyrical cliff-jump for long-time fans. Just like that, the quarter-life crisis that had been boiling beneath the marriage-and-picket-fence existence of At Home With Owen was at once assured and destroyed, giving New Leaves the respectable task of graduating into strange, unsure notions of adulthood. Kinsella confirms as much while drinking with college kids on Never Been Born, discovering his bones feel older when he’s away from home by closing “it’s a young man's game / and about time I quit”. By no means does this chapter-turning imply that Kinsella has been assimilated into big-box suburbia, thank god, as this self-described “house-broken, one-woman man” remains as stubborn and confused as ever. Between skirting responsibility in favour of playing his guitar (Too Scared To Move) and refusing to cater to demanding fans at his shows (Curtain Call), New Leaves presents the same unflinching Kinsella we’ve grown to love. Only now, we’re growing up with him as well. Beyond his newly domesticated surroundings, At Home With Owen also found him trading in his mother’s house – a regular recording spot for previous releases - for a full studio, which fleshed out his guitar-based tunes with a variety of strings and keys. Those production techniques have been fully embraced here, fleshing out Owen’s trademarked acoustic flourishes with punchy electric guitar on Good Friends, Bad Habits and warm strings on the uptempo Amnesia and Me. These pillowed arrangements sweeten Kinsella’s occasional bitterness on A Trenchant Critique with its vaguely electronic percussion and string-laden backing and truly startle listeners on Brown Hair in a Bird’s Nest’s gorgeous climax, as the orchestration tenses up over Kinsella’s “I didn’t lie to you…” confession before unfurling elegantly upon his admission “…I just didn’t tell the truth.” Despite the lovely veneer of New Leaves, Owen’s lyrical bite remains as devastating as ever. Like Rembrandt’s self-portraits, Owen’s discography directly reflects the growing pains that time and age introduce, documenting the successive stages of confidence, cowardice and acceptance that most artists tend to cheat. And while Mike Kinsella remains a potty-mouthed contrarian at heart, time is dulling his self-righteous streak into something quite dignified. New Leaves may tackle some subtle rites of passage - small in scope but difficult for most men to deal with – but they’re approached with such delicate grace, it’s hard to question that this may be Kinsella’s finest hour yet.